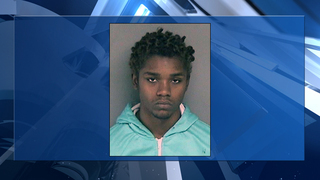 NORTH LAS VEGAS, Nev. - 8 News Now is learning more about the fifth and final suspect arrested in connection to the murder of 11-year-old Angelina Erives. The young girl was gunned down in her home after police say gang members targeted the wrong house in a retaliation shooting. This happened on Nov. 1, near Deer Springs and Lawrence Street in North Las Vegas. Isaac George, 19, is the last suspect police were looking for in connection to the deadly shooting. He was captured in northern California and is awaiting extradition back to North Las Vegas. "To the those guys that did this, I forgive them," said Annabell Sarabia, Angelina's mother. Those powerful words from the mother of Angelina Erives were said just days after her 11-year-old daughter was killed. Investigators say the suspects shot up the wrong house. “Angelina was such a beautiful little girl. She loved everybody she didn't know what hate was,” Sarabia said. With the help of other law enforcement agencies, North Las Vegas Police arrested their last suspect in the case. George was arrested in San Leandro, California near San Francisco. The FBI's Criminal Apprehension Team found him. The specialized task force is a multi-agency effort. 8 News Now asked North Las Vegas Police to speak about the partnership, but they declined. Days before the Nov. 1 shooting, court documents show there was a warrant issued for George's arrest in a burglary case. And in February, the mother of his 1-year-old child filed for full custody, stating George had made verbal and physical threats towards her. In a short conversation over the phone, the mother told 8 News Now, they were actually sharing custody of the baby. She says she was aware of his arrest for murder and was in contact with George. Before hanging up, she declined an interview, saying we would only make him look bad. Police say George was one of the three suspects seen in surveillance video firing at Angelina's home. The other two have been identified as 20-year-old Jarquan Tiffith and 16-year-old Damion Dill. Investigators believe 17-year-old Erin Hines was the getaway driver and 19-year-old Guy Banks III was in the passenger seat. He was shot and killed by a neighbor who heard the gunfire. The four surviving suspects are or will be charged with murder. Hines and Dill are underage but are being prosecuted as adults. As for George, he'll be in court Friday in California. He does have the right to fight extradition, which would just delay the process of bringing him back to Las Vegas.